This is a question I get asked all the time. When an owner has passed and has rental property should the heirs sell the Morgan Hill probate or trust home with the tenants in place, or wait until the lease is up? While most years I would say wait until the tenants are gone, but with the uncertainty of how the new tax laws will effect prices and what will happen to the Morgan Hill market that has already shown signs of appreciating with very tight inventory, the answer is not clear cut. Morgan Hill school Priority 1 Registration starts in Jan. That is the best chance of getting your child in the school closest to you. There is always a space in a Morgan Hill school for a resident, but getting the one closest to you is best obtained if you are a resident during this period. Selling with tenants in a Morgan Hill probate rental may allow the buyer to get a leg up on school registration for the next year. Interest rates are lower now than they will be next summer. A one million dollar Morgan Hill probate home has a very good chance of having a loan on it so the less a buyer has to pay for the mortgage the more they can afford for the home. For every 1 point increase in interest rates there is a 10 % increase in payment. The inventory is very low and the Morgan Hill housing is market still active. It is unknown what will happen as the year goes on. The market could go down as interest rates go up, or if there is a natural disaster, a world event, or terrorist attack. Some people who buy Morgan Hill homes in Probate or Trust early are happy to rent the house out until the end of the school year because they do not want to move until school is out if they are relocating. The tenant may be messy or say inappropriate things to potential buyers which could depress the price. If the tenant does not have beautiful furniture the professional pictures will not look as good. You can have the interior painted, wood floors refinished, new carpet, and any other cosmetic upgrades you want that will help bring in more money. You can professionally stage the property and the photos will look much better. Much easier to show the house and have open houses which bring in more people and help bring in a better price. Interest rates will be higher which will depress the price. It is unknown by how much because it also depends on how the stock market is doing, most likely for Apple, Google, Facebook, and Linkedin. The limit of deductions for state and local taxes, and for mortgages over $750,000 may depress the market over time more than it is now. There is great momentum right now as Google has announced it is expanding to Downtown San Jose. Homes in South San Jose have appreciated so much it is hard to find a good one under a million. Will this last? 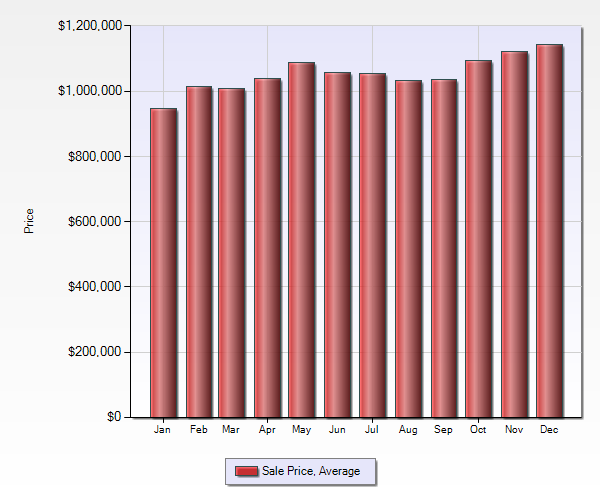 The best time to sell a home in Morgan Hill is in Jan thru early June. The second best is the fall. If the tenants are out in June and the home is prepared in July and Aug and on the market in Sept you have missed the best time, but may get the second best time, but only by waiting until Sept to put home on market. So as you can see the answer is not clear. No one can say for sure what will happen to the real estate market in 2018. If you are in this situation now it is probably a good idea to add your own Pros and Cons to this list to get a feel for what may work best in your situation. If you have any questions about selling a home in Probate or Trust please feel free to contact me. In California, if there has been a death on a property that fact needs to be disclosed to prospective buyers in writing for three years after the death. After three years if a prospective buyer asks the agent and seller need to answer honestly. In the past homes Probate homes in San Jose where there has been a death on the property sell on average 10% below what they would have sold for if there had not been a death. At this moment in time, and it may be for only this moment in time, that common knowledge is no longer applicable. San Jose Probate homes where there has been a natural death are not getting hit with the 10% "death tax." There is a very good reason for this. Two reasons actually. 1. There is no inventory of homes for sale. The number of homes for sale is at their lowest number ever. 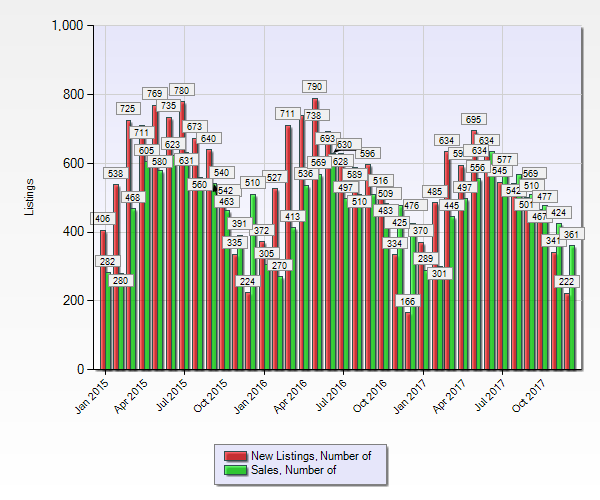 As you can see from this chart in new San Jose home listings in red are at their lowest level in the last three years. In June, 2017 Google announced they were expanding their campus to downtown San Jose at the Diridon station area. Since then prices have sky rocketed, 10% in areas close to the new campus. As you can see average sales price of a single family home in San Jose has increase by 10% since the Google announcement in June of 2017, from $1,050,000 to 1,175,000. What this means for a Probate sale in San Jose where there has been a death is that the Google bump and low inventory should cancel out the "death tax" from the death on the property. 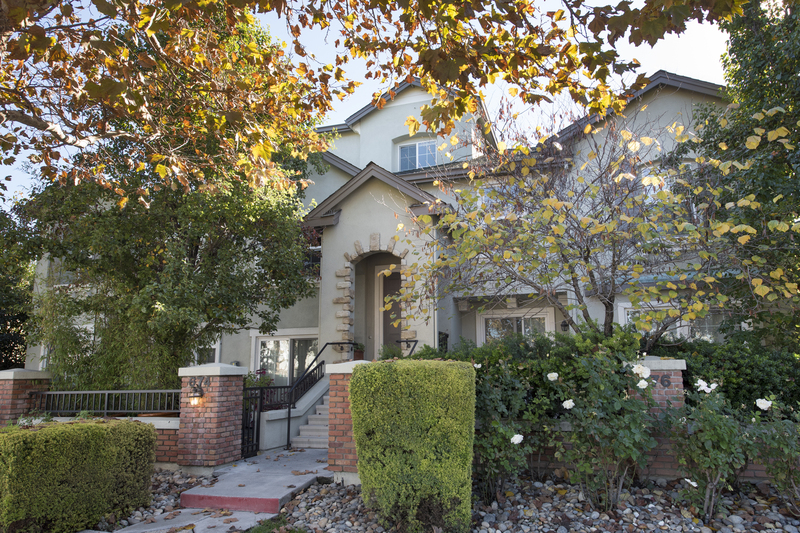 I recently listed a townhome in Willow Glen where the owner had died peacefully at home. The last sale of that model in that development was $960,000 in May of 2017. My listing sold in Dec 2017 for $1,100,000, over 10% more than the last sale, despite the death. So, if you are an Administrator of a Probate Estate, or a Successor Trustee of a trust with property now is probably not the time to wait the 3 year waiting period for written death disclosure. You may want to sell now and take advantage of the very favorable real estate market in San Jose. Anyone who has looked for acreage in places like Pescadero, Gilroy, or Morgan Hill has probably come across a situation where a neighbor or friend has horses or goats or cows who graze the property. You ask to see the lease and the response you get is often, “There is no lease, they have an informal agreement that Ms X gets to keep her livestock on the property in exchange for the livestock grazing Mr Y’s land. Mr Y does not have to pay the high cost of keeping the grasses and weeds cut and Ms X does not have to pay the high cost of boarding and feeding her livestock. It is a win win, and for decades no one has formalized the agreement. Then, unfortunately Mr Y dies and his heirs need to sell the Probate acreage in Pescadero, or Gilroy, or Morgan Hill. There is no documentation of the agreement and no one is sure what Ms X’x rights are, or what the estate has to do to terminate the relationship. Or maybe the buyer of the Pescadero Probate acreage’s , Mr and Mrs Z’s don’t understand what their responsibilities are if they want Ms X to continue grazing, but don’t want her to have full tenant’s rights. In other words, Mr and Ms Z still want to use the land, so they do not want to lease out a portion of the Pescadero or Gilroy, or Morgan Hill land. They just don’t want to have to pay someone to mow it. The answer to this dilemma is for Mr and Mrs Z to grant Ms X a license for Ms X’s horses to graze on a portion of the Pescadero Probate property they are buying. The license can be terminated at any time by the owners of the property. There are no tenant’s rights for exclusive use and Mr and Mrs Z do not need to give any notice or have any cause to terminate the agreement. The right to graze horses is a personal privilege and is not tied to the property in question. The horses do not have any exclusive use and Mr and Mrs Z can use the grazed property any time they want. If Ms X had a lease then she and her horses would have exclusive right to use the property and Mr and Mrs Z would have to give notice to enter that portion of the property and could not tell Ms X to leave whenever they want. It is a distinction that is important to preserve the rights of Mr and Mrs Z to use their new Probate property in Pescadero, or Gilory, or Morgan Hill. I suggest if you are going to do this you consult a lawyer before closing escrow on that gorgeous view property in Pescadero, or Gilroy, or Morgan Hill, or anywhere else you may find it. If you have any questions about buying or selling property, especially in Probate in San Mateo, Santa Clara, or Alameda County please feel free to contact me. What Does an Administrator Of A Redwood City Probate Estate Do With An Offer Unlikely to Close? In a Redwood City Probate sale, sometimes the highest offer turns out not to be the best offer, but until it does not close, it is impossible to know that. So what do you do if you are the Administrator of a Redwood City Probate Estate and you are faced with very different competing offersrs. There is not one right answer, but here is an example and some things to keep in mind when making your decision. Remember the guiding principle here is that I am making the assumption that you have full authority to sell the home and court confirmation is not mandatory. If the sale has to be confirmed by the Probate court then this blog does not apply to you. The Administrator of the Redwood City Probate Estate with full authority gets to make the decision as to which offer is accepted, but that decision must be sent to all the heirs of the estate in a Notice of Proposed Action. If any heirs object, the sale may have to go to Probate Court for confirmation and an over bid process which will cause months of delay. The Administrator of the Redwood City Probate Estate is charged with getting the best price and best terms for the house for the heirs to the estate. Best price is easy to determine, best price is not. 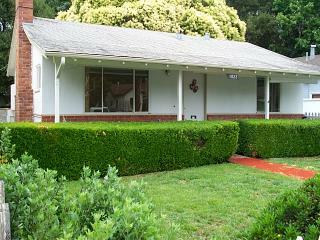 Take an example of what happened in one of my Probate listings in Redwood City. I was hired to sell a home in Probate in Redwood City. The home had major cracks in the walls, a broken heater, bad plumbing, broken windows, major floor slopes, a garage that was leaning, and the house basically looked like it was being held up by termites holding hands. The Probate Court sent out a Probate Referee who said the value of the house was $575,000. The Administrator of the Redwood City Probate Estate hired me to sell the house. I suggested getting inspections. The foundation inspector said the foundation was no good and would cost ninety thousand dollars to replace. We decided to list the house at $650,000 because the market was rapidly appreciating and the house had a lot of charm and a great location even though it needed so much work. Other homes in the neighborhood were selling in the $800-$900,000 range. 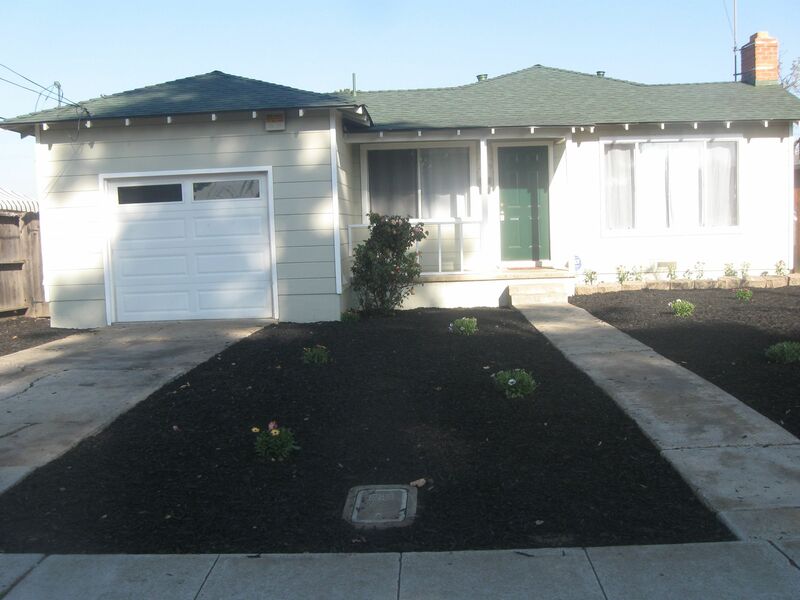 The seller received 3 offers for the Redwood City Probate home. $650,000 As Is, no property contingency, 14 day loan contingency. $600,000 As Is All cash, no inspections or contingencies of any kind, close as soon as the heirs sign a Notice of Proposed Action. $800,000, All Cash, No appraisal contingency, 5 day property contingency. This $800,000 offer seemed too good to be true. I told the seller that with a 5 day property inspection I expected the buyer would come back and try to re negotiate the price even though all the inspections were done and we knew very little, if anything could be salvaged. At that point if the price was over $600,000 then it was worth the risk. It was also possible the buyer had never seen the house, had no idea what he was doing, and was making high ball contingent offers on many properties with the hope someone would take his offer and then he could decide if he wanted the property. He was as likely to cancel the contract as not. The Administrator of this Redwood City Probate Estate decided she had to take a chance on the $800,000 offer. She knew it was a long shot, but if she did not accept it the other heirs could accuse her of not taking the best offer for the estate because she was in a hurry to close escrow and get her money. She knew that for them the higher price was worth it even if they had to wait longer. So the highest offer was accepted and 4 days later the contract was cancelled. The buyer discovered how much work needed to be done, despite supposedly reading all the reports, and dropped out. The offer for $600,000 was then accepted as the buyers were still interested and closed escrow 14 days later. The heirs all agreed that they gave it a shot at getting more than the house was worth, and were willing to take market value for the house. So, if you are an Administrator of a Probate Estate sometimes the highest price offer may not seem like it will close, but taking a chance on it can be the best thing for the estate, and if it does not work out at least you have fulfilled your fiduciary duty. As a realtor who specializes in Probate sales I have recently been involved with a number of families were trying to sell homes they thought they inherited or had title to, but wound up in Probate instead. Since the Probate courts are backed up, this can cause delays, heartache, and tension for the families and were problems that probably could have been avoided. I want to say firmly, I am not a lawyer. I am a Realtor who specializes in selling homes in Probate and this is not legal advice. If you are going to be involved in intra family title changes PLEASE get the advice of a lawyer. This is complicated stuff. Mom and Daughter 1 own a home together. Both are on title as Joint Tenants and own it equally. They need cash so Daughter 1 gives her share to Mom and Mom gets reverse morgage. Mom does not make a will leaving 1/2 the house to Daughter 1 and 1/2 the house to each of the 4 daughters including daughter 1. She plans on doing it, but never gets around to it. Mom dies unexpectantly, with no will, no trust, and only a verbal agreeement with Daughter 1. Reverse mortgage company tells Daughter 1 she needs to sell the house or pay back the reverse mortgage. Daughter 1 can not sell the house or do anything without Probate Court permission because she does not own the house any more and there is no will or trust. Daughter 1 calls me and give her a referral to a Probate lawyer who will get paid through the sale of the house since there is no cash in the estate. Daughter one will ask the court to appoint her Admistrator of the estate then ask the other 3 sisters to give up the half of the equity that was supposed to go to Daughter 1. Hopefully the Probate Court will agree to all of this. It is not guarenteed. As you can see, these are complicated issue, made more complicated by actions taken by owners and family members before the owners died. The moral, just because you think you have the right to sell a house in probate, that does not mean you do. Be sure and consult a Probate Attorney and a Realtor who understand Probate Sales before you proceed. If you have any questions about selling a home in Probate or need a Probate Realtor in Half Moon Bay or anywhere else in the Bay area please feel free to contact me. Mom owns home in Pacifica in a trust free and clear after Dad passes. She needs money for daily living expenses so she takes out a reverse mortgage. Eventually she is unable to care for herself. She takes the house out of the trust and gives half to Daughter 1 as joint tenant so daughter has right of survivorship and right to sell house to pay Mom’s assisted living expenses. Mom’s health gets worse and she needs to be moved to assisted living. Mom and Daughter 1 decide to sell the house to pay for the finest assisted living they can find. Mom moves to assisted living and 3 days later dies. Daughter 1 wants to sell the house which has plenty of equity that was not used to take care of Mom, so she plans on splitting it with Daughter 2 and Son 1. Reverse mortgages are for senior home owners only, not their children. Daughter 1 should not have been on title because she was not given permission by Reverse Mortgage Company. Joint Tenancy is an equal partnership between all parties. All partied must be equally responsible for any liens/mortgages on the home. Only Mom was on the loan so she should have been the only one on title. You can see the problem here. I suspect this one ends up in Probate Court with Court Confirmation needed instead of a fast, clean easy sale. Tomorrow I will give you details on other issues that have come up in my Probate sales. Do You Have a Right To Sell That Half Moon Bay Probate Home? Recently I have been involved with a number of families were trying to sell homes they thought they inherited or had title to, but wound up in Probate instead. Since the Probate courts are backed up, this can cause delays, heartache, and tension for the families and were problems that probably could have been avoided. I just want to give you a few examples so you can see that you should not assume anything when it comes to Probate sales. Mom owns home in Redwood City free and clear with no mortgage. She has 4 children and wants only 2 of the children to inherit the home. She signs a deed transfer her daughter, not a lawyer, drew up saying that instead of owning the house only in her name she gives 1/3 interest to one daughter and 1/3 interest to one son. Mom dies. Son and daughter think they inherit the house 50/50, but that did not happeb. Deed does not say all three own as Joint Tenants. That would have provided the right of survivorship. Not only that, but daughter as executor of estate can’t sell the house. The 1/3 interest of Mom now has to go through probate and since there was no will all 4 children get to split Mom’s 1/3. Daughter has to be appointed by the Probate Court as Administrator of the Estate before she can sell the home. It gets worse. They have to go through probate, hire a lawyer, and pay court costs for 1/3 interest in a house. The mistake here was not spending the money up front to get advice on how to accomplish Mom’s wish that only two of her children inherit the house. If you have any questions about selling a home in Probate in Half Moon Bay or anywhere else in the Bay area please feel free to contact me. I was recently asked by some clients if I would help them make an offer on a Sunnyvale Probate Sale. Being that there is nothing more I enjoy in real estate than Probate sales of course I said yes. This particular property was a little different than most of the Probate Sales I have been involved with. Many Sunnyvale Probate sales are done under the Independent Administration of Estates Act. With these types of probate sales the Personal Representative of the estate is given full authority by the Probate Court to sell a home which has been left in a probated estate. As long as the heirs have no objections, the Personal Representative is able to have the home marketed by a real estate agent and accept an offer. In some other cases the court does not give full authority to the Personal Representative of an estate and an accepted offer needs to go to court for confirmation. When this happens an over bid process is allowed and the first accepted offer can be outbid by a subsequent buyer. In the case of this Sunnyvale Probate Sale the process was unusual. The estate was being represented by The Santa Clara County Public Administrator's Office. While generally when the Public Administrator is the Personal Representative for an estate the sale usually goes to court for confirmation, in this case the Public Administrator was given full authority to sell the house. The plan was that all offers were to be presented at 3 PM at the Public Administrator's office on July 28th. The offers for this Sunnyvale Probate sale needed to be accompanied by a certified check for 5% of the offered price. The offer would be the offer with no chance for counter offers or any changes after acceptance. A 10 day contingency period was allowed. Unfortunately my clients had some trouble getting a a certified check. There was a computer glitch in getting money wired from an out of state bank to a local bank so they could get certified funds. I left Palo Alto at 2:30 PM with the hopes of getting to the Public Administrators office before 3 PM. The listing agent warned me that if I was late my offer might not be considered. Due to circumstances beyond my control I walked into the Public Administrator's Office at 3:08. My client's offer for the Sunnyvale Probate Sale was not considered. There was a call for offers at 3:05 and I missed it. No exceptions. I understood. There was a room full of agents who got there on time and I did not. So no offer presented on this Sunnyvale Probate Sale. As it turned out my client's offer was sixty thousand dollars less than the winning bid so my being late was irrelevant. However it was a great lesson in making sure to follow directions exactly when making an offer on a Sunnyvale Probate Sale. If you have any questions about buying or selling a Probate sale please feel free to contact me. 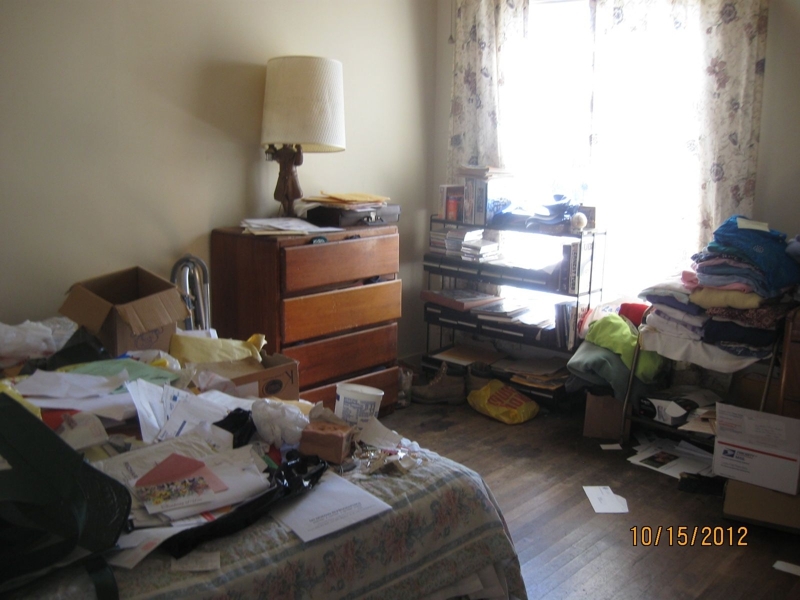 Are you the administrator of a North San Jose Probate sale home that belonged to a hoarder? Maybe it was a home that was living in for 50 or 60 years by a relative or close friend who had a lot of family mementos and a soft spot in her heart for them. Maybe he was a collector of things which seemingly have no value today like technical manuals from the 60's. You need to sell the North San Jose Probate home but it is filled with stuff. The house is worth many hundreds of thousands of dollars, but the estate has little or no cash. Or the estate has cash, but the heirs need every penny they can salvage out of the Redwood City Probate sale. What do you do? As the Personal Representative for the estate you have several choices. 1. Do not try to figure out yourself what is valuable and what is not. Get a professional in to tell you. For example you could call DGW Auction House and see if they want to try to sell anything. They will know what will sell and what won't and will take away what has some value and the Redwood City estate gets the money for it after they sell and take their portion. Yes you do not get 100%, but they will know what has value and unless you are an appraiser you will not. 2. Next step to to gather up what is donatable and find a charity who will come and pick up anything that won't sell but can be used by someone. The key here is to find who will come and pick up so you do not have to lift furniture. 3. You are then left with debris. Some of this will be recyclable and some will not. Separate what you can recycle and that can be done for free. 4. What is left is trash. If it does fit in the trash can over a period of weeks that you have available while selling the North San Jose Probate home then you can call a hauler and have the trash hauled. At this point it will hopefully be a small enough load that it will not cost very much to dump it. As an alternative you could just call me to list your North San Jose Probate home. I will arrange for all of the above to happen. You don't have to lift a finger and the yucky work of cleaning out a North San Jose Probate home is done by me. If you have any questions about selling a North San Jose home in Probate please feel free to contact me. A few months ago I was contacted by an administer of a probate estate in East Palo Alto. He wanted to sell his mother's home but was in a quandary. His mother had died last year and all her belongings were in the house. His sister was still living in the East Palo Alto probate home and she was a hoarder. The home was a mess and his ill sister did not want to move out until the house was sold. Since all the heirs have to agree to the sale, and his sister was hard to convince to co -operate, he did not know how to get the house sold so they could close this East Palo Alto probate. I explained they could do an off market sale where the house would not be exposed to the public and there would be very little disturbance to his sister. I also explained he would get less than he would on the open market. My client thought if he could get around $390,000 he would be satisfied. I called an investor I knew who flips homes and he immediately offered $385,00 for the home. However after further investigation he dropped his price to $360,000 which my client did not want to take. It is so common for investors to offer you a price you will take to tie the house up, and then lower it after you are in escrow, with the hopes you will agree. In this case my client did not agree and canceled the sale. He managed to convince his sister to leave the house so we could sell it. After a little de cluttering, but not that much, I put the home on MLS, did pre sale inspections, and held one open house. My East Palo Alto probate sale received 6 offers and sold for $422,000. The East Palo Alto estate receive $62,000 more by going on the open market, 17% more than the investor was willing to pay. I hear this story over and over again. Many investors will try to convince an Administrator of an Estate to sell the home off market because it is a mess, or needs repair, or just ugly. If the Administrator is not familiar with the market or just overwhelmed it may seem like a good idea. It is not. If you hire a real estate who is familiar with East Palo Alto probate sales and knows how to properly prepare a home to bring out its best attributes, then selling off market will be a financial loss. Let the East Palo Alto real estate agent do the work and you can collect the money. If you have any questions about selling an East Palo Alto probate home please feel free to contact me. I have a proven system to prepare and sell probate homes to get you the best price and terms. 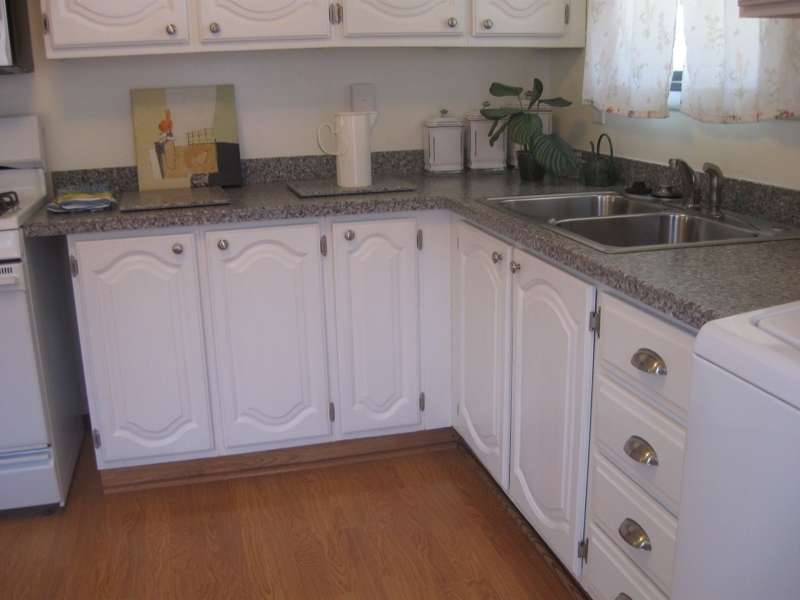 Yesterday, I listened to offers on my latest probate listing, a very cute condo in Sunnyvale. It is an 880 square foot condo in a great location right across from a large park, and close to many Silicon Valley high tech companies. The schools are good, there is an inside washer and dryer, double pane windows, a two car garage, fresh paint, new carpets, a newer bathroom, and a dining room. It was listed at $409,000 which is a great price for a Sunnyvale probate condo that offers so many amenities. The Sunnyvale Probate condo was popular. I knew there would be multiple offers and let everyone know it was a probate sale, posted all the HOA docs, inspections, and disclosures on my website, and spent hours explaining probate sales to agents and buyers. Offers were due at noon yesterday. I received eight of them, a few more than expected. Of the eight, only four were on the California Probate Purchase form. Of these 4 only one was completely filled out correctly, and one had only one small mistake. Four agents used the wrong form, period. I competed for this listing with 4 other agents and I was chosen because of my knowledge and experience with Sunnyvale Probate sales. The seller, who is the Personal Representative for the estate even told me there was another agent he personally liked better, but she did not have Sunnyvale Probate experience. If you do not know what a personal representative is, you are a rookie. There were agents who submitted offers that I liked also, but they made a big rookie mistake. This is a very competitive market. Agents need to be on top of their game in order to represent both sellers and buyers properly. It starts by understanding the contract and the documents needed for each type of sale. In a Sunnyvale Probate Sale, use the Probate Purchase Form. Then write a great offer, but without the right form, you will get nowhere. If you have any questions about buying or selling a home in Probate, please feel free to contact me. If you want to read my Probate and Trust blog click here. As a Menlo Park Real Estate Agent I can tell you the market is hot and listings are few and far between. The California drought does not just refer to out lack of rain. If you are the executor of a Menlo Park estate with real estate to sell you may be thinking this will be an easy job. In some ways it is, because there is little competition and many buyers. This makes for huge jumps in appreciation which is great for the estate. Buyers will make offers way above current market with no contingencies. This can be a blessing or a curse for a Menlo Park Trust sale. When the market turns south, which it will inevitably do, or if the buyer believes he/she made a mistake, the buyer who made such a great offer may turn around and try to get the estate to compensate him/her for the perceived wrong doings. The best way to protect the Menlo Park estate is to make sure that the paper work is totally in order. While you may think that any experienced real estate agent can do this, that is not true. I was just involved in transaction where the very successful and "experienced" agent made every mistake in the book when it came to Menlo Park Trust Sales. 1. First mistake: No trust advisory was signed. The trust advisory is a document which spells out which disclosures the estate must provide the buyer and which ones are exempted. Without the trust advisory the executor would have no way of knowing what she was supposed to and not supposed to sign. 2. Seller filled out and signed disclosures that should not have been provided. The seller filled out the transfer disclosure statement and the seller's supplemental disclosure. This should not have been done because now if the buyer discovers something that was on the disclosure or more importantly left off the disclosures there is an opening to claim that the disclosures were wrong. Since the executor did not live in the house these should not have been filled out. 3. Seller signed the Natural Hazard Disclosure instead of just providing it. By signing they vouch for the company. See the same problems as #2. My buyer did not get her offer accepted on this Menlo Park trust sale and I hope the buyer who does loves the house and has no problems. But, if you are going to hire a real estate agent to sell your Menlo Park trust sale, make sure that person does not make these amateur mistakes. You will sleep much better. If you have any questions about Menlo Park trust or Probate sales please feel free to contact me. I provide free staging for all my Trust and Probate listings and have a proven system for clean out and cosmetic upgrades to help your home sell for a higher price with no out of pocket expenses. As many of my blog followers know I sell a lot of Menlo Park homes in trust and probate. The owners were often very old, as are the homes, and frequently in need of repair. While it is often a good idea to keep repairs at a minimum in order to decrease the liability to the estate, sometimes it is necessary in order to allow buyers to be able buy and move into a home safely, or in order to increase the value exponentially. I am currently sellling a Menlo Park home that needed some major bathroom repairs since it was unclear an adult could stand on the bathroom floor without falling through to the crawl space. No amount of staging was going to fix that problem. 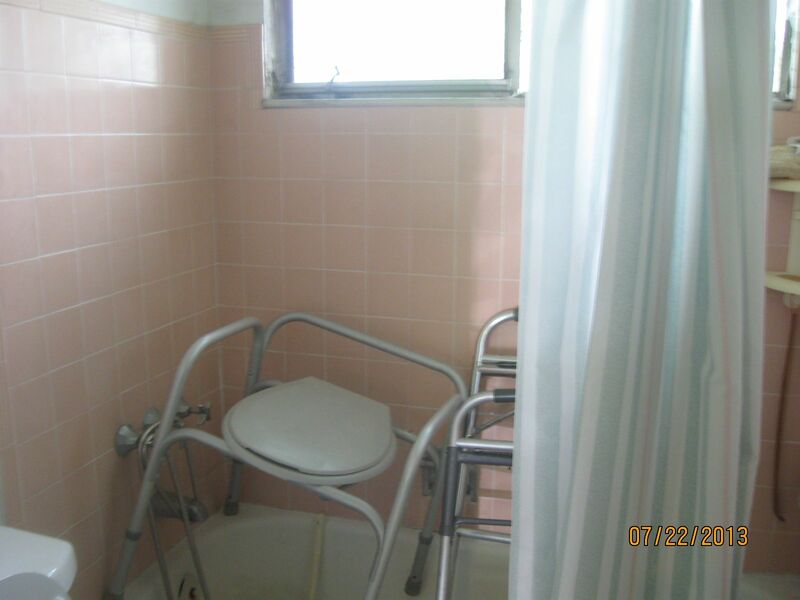 The second bathroom in this Menlo Park home was not much better. The seller of this Menlo Park home decided to redo both bathrooms and Preferred Termite company was generous enough to allow the $15,000 payment through escrow. The house went on the market generating plenty of interest and multiple offers. The seller of this Menlo Park home chose a nice couple who were pre-approved for a loan and felt comfortable enough with the reports and repairs done by the seller that they waived the property condition contingency, knowing that there was still more work to be done on the termite report. They could use the new bathrooms and felt the rest of the termite work and replacing the roof could happen over time. Unfortunately their lender did not agree. There was no problem with the appraisal or underwriting. However, one day before we were due to close the funder looked at the seller's HUD1 (final closing statement) and saw that there was a $15,000 payment going to Preferred Termite. They said that all work called for on the termite report, including providing more access to the crawl space by making a new opening, had to be done before funding the loan. Lesson learned. Fortunately neither the seller of the Menlo Park home or the buyer were trying to meet a deadline so the buyer switched lenders, the Menlo Park home seller will pay the termite company out of escrow so it is not on the closing statement and we will close in 2-3 weeks. So remember, when selling a Menlo Park home do not put payments for inspections or termite repairs in escrow or the buyer's lender may ask to see them and muck up the sale. If you have any questions about selling a home in Menlo Park please fell free to contact me. I am currently getting a Santa Clara Probate sale ready for market. However, for a variety of reasons the Personal Representative has decided to let the Santa Clara Probate Process finish up before putting the home on the market. As a result, she has now inherited the home outright and so the rules have changed some. This means that she can now do repairs on the house without putting the Santa Clara estate in jeopardy of increased liability. The previous owner was almost 100 years old when he died and there is a lot of differed maintenance. Both bathrooms were completely filled with dry rot, besides being old, ugly, and dirty. 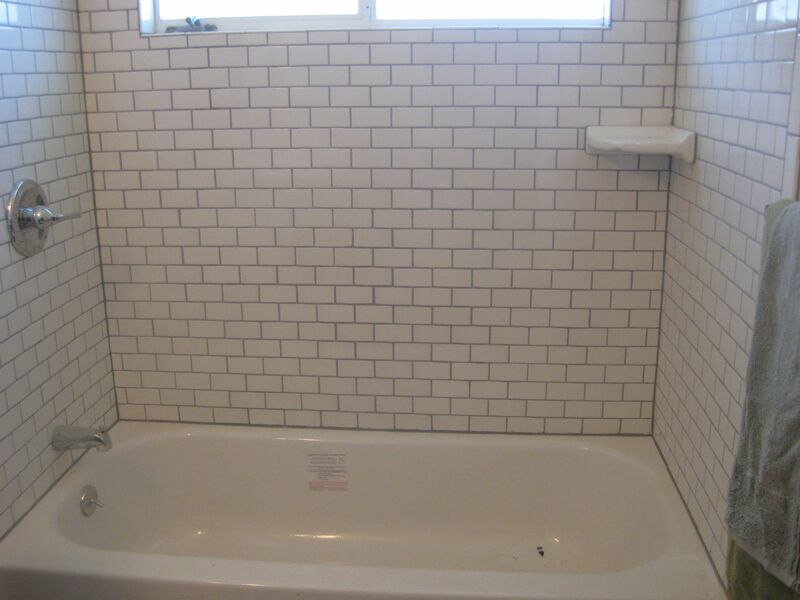 She made the decision that it was worth having the termite company come in and get rid of the dry rot, replace the fixtures, and re tile the bath rooms before selling this Santa Clara home. That seems very straight forward right? The termite company came into this Santa Clara Probate home before sale and removed everything in the original baths, put in new shower valves, and then called the city in for an inspection. The Santa Clara city building inspector came to the house and said the work was fine, but in order to final the permit the contractor had to hard-wire the house for smoke detectors and carbon monoxide detectors. Just putting them on the walls was not enough. He wanted them all hardwired together. Plus, he wanted motion sensor detectors in the light switches in both bathrooms. Neither the contractor nor the owner of the termite company had ever had to do this before, and they rip up bathrooms every day. However, as the expression goes, you "Can't fight City Hall." If the Santa Clara Building inspector says all the smoke detectors and carbon monoxide detectors have to be hardwired and the light switches have to be motion sensor-ed then it will get done. The electrical panel is old, has fuses, and needs to be replaced. My client decided she was not going to do it for fear they would ask her rebuild the chimney in order to get a permit to replace the electrical panel. Some cans of worms are not worth opening. As a Santa Clara Realtor who specializes in Probate Sales I have found many unusual things left at house that were not wanted or noticed by the heirs. Since I offer to clean out and stage the Probate Homes I sell I get to deal with al the junk that is left behind. You see when someone dies an estimate of the value of the personal items is given to the court. After that the items that were left to specific people are distributed. These are usually the things of monetary or sentimental value like jewelry, artwork, or good furniture. Sometimes there is no will, or no specific designation, so any valuables will be sold and the money added to the money that will eventually be divided amongst the heirs. This can be done by an estate seller, a garage sale, or an auction house. What is left is trash, things to recycle, and things to donate. This is where I come in. I bring in my crew and we recycle metal, paper, cans, old appliances, anything that can be recycled, donate anything that Goodwill or Saint Vincent DePaul will take, and trash the rest. After that I get the home painted, make sure the flooring is fresh, and fully stage the house. We look at every item to make sure it really is worthless and that there is no money in a pocket or under a mattress. We have found some unusual things, but what we found at my latest Santa Clara Probate Sale is a first for me, someone's ashes. This person died in 1951 and we had no idea whose they were. The owner of the home was 100 when he died, and his closest relative who is the Personal Representativeof this Santa Clara Probate home is a much younger cousin and had no idea who the ashes belonged to. After speaking with a neighbor we discovered that the ashes belonged to the owners son. They had been living in NYC in 1951 when their 5-year-old son was hit by a bus and killed. Our 100-year-old owner had kept the ashes with him for 62 years. My client, the younger cousin has taken the ashes so the two can be buried together. I was so happy to be able to do this for the family. It is very satisfying to take a probate home from trash filled to cleaned up, painted, and fully staged in order to increase the value for the heirs, which is what I do. But it is even more satisfying to help a family preserve memories and wishes. As a San Jose Probate Real Estate Agent I have seen many things happens in transactions, but this one was a first for me. I listed a cute home in Alum Rock for a family whose parents had both recently passed. The parents left a will but they did not have a trust. Since the estate was not in a trust the assets of the estate need to go through Probate before they can be distributed to the children of the couple who passed. One child was named Personal Representative of the estate. That is, since the parents are not here to distribute their estate, a personal representative is appointed by the Probate Court to make sure the debts are paid, the taxes are filed, the assets are sold, and the money is distributed in the way the parents specified they wanted it to be done in their will. If there was no will then the estate would be distributed the way the State of California has determined it should be done when there is no will. When the oldest son was named Personal Representative it also allowed him to sell his parent's house under the Independent Administrations of Estates Act. That means he has the right to accept an offer on the home, and as long as none of the other heirs object the house can be sold without further court approval or an overbid auction at court. If the Personal Representative does not have full authority to sell a home then once an offer is accepted it goes to court where another buyer can try to purchase the home by over bidding the first accepted offer. I listed the home, got a great offer, and escrow was opened. Everything was fine until the underwriter saw the file. He said he needed proof the son was authorized to the sell the house. We gave him the Letters of Testamentary which say the son is the Personal Representative for the estate and has full authority to sell the house. The underwriter said that is not good enough. There was nothing on the Letters that specifically said he could sell the probate house in Alum Rock. The title report says the house belongs to the parents. The Letters say the son has the right to act as the parents. In every Probate sale I have done in the last 18 years this has been enough for the underwriter. In every Probate sale my escrow officers has done in the last 30 years this was enough for the underwriter. But not this one. I solved the problem by getting the original Petition to Administer the estate from the court files. this document has the name of the Personal Representative and the address of the property so that worked. Just another San Jose Probate challenge met. I got a call this morning from a very sweet but distraught woman about a home in Santa Clara that belonged to her grandmother and was supposed to be a trust sale. However the home is now 2 weeks away from a foreclosure sale and this did not have to happen. 1. Grandmother owned the home and took out a reverse mortgage with Wells Fargo. 2. After Grandmother got her reverse mortgage and before she died she put the home in a trust and did not inform Wells Fargo she had done this. 3. Grandmother dies and the successor trustee, grand daughter is in charge of dealing with the house. 4. Granddaughter tells Wells Fargo she is the successor trustee and will be selling the house which is a requirement with in 3 months of the owner passing or leaving the house. 5. Wells Fargo tells Granddaughter they were never informed that the house was in a trust and they can not speak with Granddaughter because Grandmother never gave them permission and never transferred the reverse mortgage into the trust with their permission. 6. In April Wells Fargo records Notice of Default. 7. Granddaughter calls a lawyer who says he does not know why this happening but does nothing. 8. In July Wells Fargo records Notice of Trustee sale for Aug 13. 9. Granddaughter call me for advice. 10. I tell her to call my lawyer, Rebeccah Miller at Lakin Sprears in Palo Alto to try to get this sorted out. If the home were in Probate then the Probate lawyer could go to a judge for an emergency postponement of foreclosure. I am hoping this can happen in a trust as well. Or maybe they can open a Probate since it looks like maybe the loan/house can not be in the trust and they need to probate it. In that case if someone works quickly enough a judge could stop the foreclosure. The point I will make again is: IF YOU ARE IN CHARGE OF A HOME OF SOMEONE WHO HAS DIED EITHER AS A PERSONAL REPRESENTATIVE OR A SUCCESSOR TRUSTEE DO NOT PUT YOUR HEAD IN THE SAND. DEAL WITH THE MORTGAGE WHETHER IT IS A TRADITIONAL OR A REVERSE AND MAKE SURE THE HOME DOES NOT GET FORECLOSED BECAUSE SOMEONE, INCLUDING YOUR LAWYER DROPPED THE BALL. If you are a Personal Representative for a San Mateo County Probate sale which do you think is riskier for you, not the buyer, taking an offer with a loan contingency, or taking an offer for your San Mateo County Probate sale with an inspection contingency? 2. The buyer has been fully pre-approved by a direct lender, is from this country or has the legal status necessary to obtain a loan. 3. You have done all of the inspections on your San Mateo County Probate home before the sale including property, termite, roof, chimney, and foundation if appropriate. So assuming all of the above conditions have been met, and you have several offers which are around the same price, which would you prefer? As a San Mateo County Probate Estate Agent my choice is different than what you may think. I think it is riskier for a seller to take an offer for the home being sold in San Mateo County from a buyer with no loan contingency, but a property/disclosure contingency. 1. Most buyers in this market have ample income and assets to get a loan. As long as there is a strong pre-approval letter a loan contingency should not be a problem. If you have a strong buyer and one bank has a problem with the loan, there is most likely another bank who will do it. With a loan contingency there is only one reason to get out of the contract, and that is the buyer just can not get a loan. 2. A property/disclosure contingency is open ended. The buyer can use any excuse about the property, neighborhood, schools, city government, they want if they want to get out of the contract to buy a San Mateo County Probate home for sale. Also, things can come up on the buyer's inspections that could ultimately cost money if they say they will not buy the house if you don't fix, replace, or do something expensive to the San Mateo county Probate home for sale. Additionally since disclosures are limited in a probate sale in order for the buyer to make a non contingent offer they must do all their investigation up front. If it is done after the offer is made you could run into trouble. I believe if you have to choose between an offer for the San Mateo County Probate home you are selling with a loan contingnecy, and one with a property contingency, the loan contingency is generally the less risky of the two contingencies. It is a fact of life that no one gets out of this life alive. It is also a fact of real estate that people who own homes die and very often those homes have to be sold. As a San Jose Probate real estate agent I deal with this situation all the time. Most of the time when a home is sold through probate the owner who died either lived in the home at the time of death, or until shortly before death and now it is time to sell that San Jose probate home. The heirs are often left with a San Jose Probate home that is filled with junk (and sometimes some treasures); may have smells from pets, smoking, urine, blood stains, over grown landscaping, and many layers of dirt. 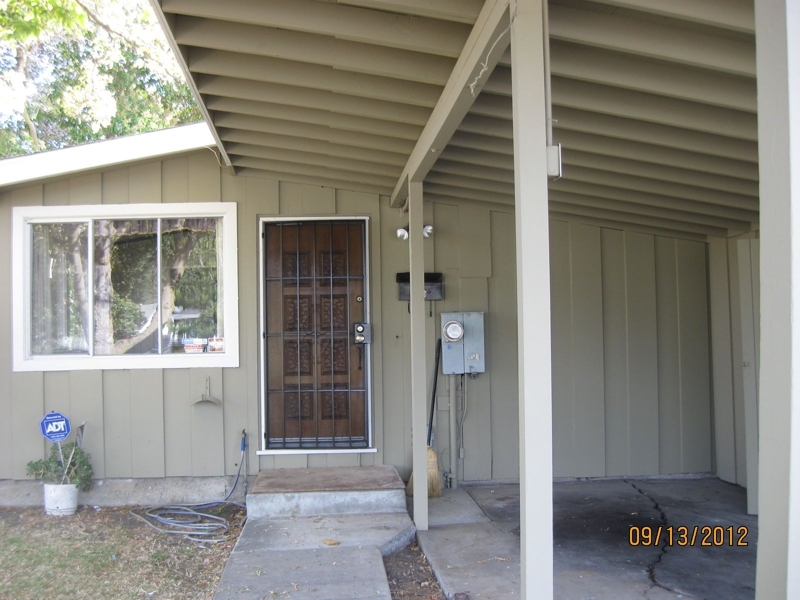 This San Jose Probate Sale home may also need a lot of repairs, but that is another story. Most Probate lawyers will advise the Personal Representative of the estate who is in charge of selling the San Jose Probate home not to make any repairs unless there is a health or safety issue. This is to minimize the liability to the estate. However, even if no structural repairs are going to be made that doesn't mean you should just sell the home in a smelly, messy, or gross state. There are things that can be done to the San Jose Probate Sale home that will not increase the liability to the estate and make it much more attractive to a potential buyer, which should help generate a better offer. 5. Stage the home to make it look as attractive as possible. If you do these things to your San Jose Probate home , you will be rewarded with grateful buyers who are willing to pay top dollar for your home. If you are a Personal Representative for a Mountain View Probate Sale I am sure you are overwhelmed with all of your responsibilities. It is not an easy job! You may be charged with selling a home or condo in Mountain View in Probate. If so, this a a great time to be doing that. However, even in a strong seller's market, you have to do whatever you can to get the best offer for the Mountain View Ca Probate estate. One of the most important things you can do right now is to get the Mountain View probate home fully inspected before you put it on the market. It may seem as if you are spending money on inspections that could be spent by the potential buyer. After all, the buyer of the Mountain View Probate home you are selling has to buy it "As -Is" so the estate will not be making any repairs anyway. This is a common mistake that many Personal Representatives of Mountain View Probate homes who are not from this area make. While it is true that the estate will not be making any repairs, it is also true that most buyers in this area are very familiar with how most Mountain View sellers market their homes. The inspections are done ahead of time and most of the offers will be non contingent on an evaluation of the property condition. They are comfortable with the condition, and once their offer is accepted you have a done deal. If you do not do the inspections before putting the Mountain View Probate home on the market, you could very easily end up with a buyer who wants to renegotiate the price or a sale that falls through. This can be very problematic if there are expenses involved in holding the home before it sells. These could include mortgages, taxes, insurance, lawn care, etc. If the estate is cash poor and house rich, which many Mountain view Probate homes are, it can be very complicated to find the money in a delay. The competition for Mountain View homes and condos for sale is fierce. Buyers are willing to pay a lot of money and give you wonderful offers for your Mountain View Probate sale, but they want to know what they are getting. If you have your Mountain View Probate home fully inspected before it goes on the market, price it appropriately, and market it widely, you will have the best chance of getting the best offers for the estate, and therefore doing the best job you can as the Personal Representative. It is a common occurrence in the Silicon Valley for homes that are in Probate to also go into default. For many older home owners there is scant cash in the bank, they may still have a mortgage, and without a trust a home goes to Probate. When that happens the bills, including the mortgage do not get paid until a Personal Representative is appointed by the court. This can be a lengthy process if there is a disagreement amongst heirs as to who should be in charge. Unfortunately that is a very common occurrence in Santa Clara probate sales. So while the relatives are arguing over who rules the Santa Clara Probate roost, the mortgage does not get paid and the lender starts the foreclosure process. Once at least three payments are missed a Notice of Default may be filed on the Santa Clara Probate Sale. This notice will give you three months to cure the default. If the owned money on the Santa Clara Probate home is not paid during that three month period a Notice of Trustee Sale can be filed and the Santa Clara Probate home can be sold three weeks after that. The attorney for the Santa Clara Probate home can go to court and get an order to temporarily stop the foreclosure process while the estate is being settled, but this takes some time as well. Because the inventory is so low and the demand for homes is so high in Santa Clara, most Santa Clara Probate Sale homes can be sold and ownership transferred during the Notice of Default period. The defaulted loan on the Santa Clara Probate home can be paid off, and the rest of the equity used to pay the other bills and then distributed to the heirs. Sounds simple, but sometimes it isn't. Once a loan on a Santa Clara Probate sale goes into default it is transferred to the loss mitigation department. Sometimes that is the equivalent of going into a black hole. These departments are overwhelmed and under staffed. It can take many weeks to get pay off information from them. In a traditional sale the title company will order pay off information less than a week before closing which is more than enough time to determine exactly how much is owed by the seller to pay off their loan. In a Santa Clara Probate sale when the loan is in default it can take many weeks to get the pay off information. The title company should start the pay off demand as soon as there is a contract. That way, maybe 30 days later they will have the figures to pay off the loan. If it is a short escrow period for the Santa Clara Probate Sale it is possible that everyone might be ready to close and there is still no pay off demand from the lender. When this happens, the escrow can still close and title can be transferred, but the money can not be distributed until the mortgage is payed off, and the estate will have to pay for a mortgage on a home it no longer owns until the bank gets its money. So if you are involved in a Santa Clara Probate Sale and there is no money to pay the mortgage make sure that the process is started right away to get the pay off demand for the loan or the estate will be paying on the loan after the escrow is closed. As a Redwood City Probate real estate agent I am always amazed at how new issues always come up. I thought I was finished, but someone else did not. (Remember the line from The Godfather which was repeated in Sopranos) My Redwood City Probate sale did not want to end. with some equity. She did have a loan with Wells Fargo. I was hired by the Personal Administrator of this Redwood City Probate to sell the home. The week the home went on the market I was contacted by a company called LPS who had been hired by Wells Fargo, the mortgage holder to make sure the Redwood City probate home was not left vacant and unattended. As requested I faxed LPS the listing agreement and my statement saying I was going to be caring for the home and it would not be abandoned. The field service supervisor at LPS assured me everything was fine. I told him they would have their money in January. At the end of December Wells Fargo recorded a Notice of Defualt against the property, but since we were going to close in a few weeks I was not worried. The Notice of Default gave us three months to pay Wells Fargo off. LPS did not contact me so I was not concerned that there would be any issues with this Redwood City Probate home. has no more say over what happens to this Redwood City probate home. sure that this is possible. So what have I learned from this Redwood City Probate sale debacle? 1. Just because one person at LPS said everything is fine make sure and check in with them during the escrow process and keep them updated on any Redwood City Probate sales when there is no money to pay the mortgage. 2. Have the Redwood City Probate sale lawyer keep in regular contact with the mortgage company, especially if it is Wells Fargo, who is the most aggressive about trying to protect their investment by changing locks and winterizing vacant homes that are in default. I don't blame them, but in this case it was definitely over kill! 3. Confirm with the Title Company of a Redwood City Probate sale that they let the lender know we have recorded even though the money will not be at the bank the next day because of a holiday. Hopefully the next time I think I am out of a Redwood City Probate Sale I will not get pulled back in. Redwood City Probate Home in Foreclosure: What do I Do? in the home, DON'T BE AN OSTRICH!!!!!! It is now very common for Redwood City homes that are in Probate to have mortgages. Many homeowners were enticed to refinance in the last decade because of easy money or low interest rates, many seniors have reverse mortgages on their Redwood City Probate homes, and some people did not refinance because of low interest rates, but because they were helping out family members. When a mortgagee dies the mortgage still needs to be paid. Death does not eliminate the obligation. So what do you do if the mortgage is late, the home is in foreclosure, and the estate has no money to pay the mortgage? It is very common for Redwood City Probate estates to be house rich but cash poor. The first thing that has to happen in a probate with this situation is that a personal representative needs to be appointed. This sounds like a no brainer, but sometimes there are fights within a family as to who that person is going to be, and while people are fighting the bank could be foreclosing. So stop fighting and get someone appointed. Once the Personal Representative is appointed he or she should hire a real estate agent. This agent should have experience in both probate and short sales. Probate experience is a no brainer, but the reason for short sale experience is because that person will know who to talk to to postpone the foreclosure. You will need to give authorization to your agent to speak with the bank and that takes a few days, so do this right away. Once the postponement is granted get your Redwood City Probate home on the market and get it sold. Postponements generally are only good for 30 days at a time, and you may not get a second one if the home does not have an offer, so don't delay. If the home has no equity then you should speak with the bank about a Deed in Lieu of Foreclosure. You may be able to negotiate the bank giving the estate $5,000 to $10,000 if you give them the keys and empty out the Redwood City Probate home. However, prices are appreciating so rapidly right now that you may believe your Redwood City Probate home is underwater when it really isn't. So, if you have a Redwood City home in Probate and there is no money to pay the mortgage, don't just stand there, do something. Take the necessary steps to get help to make sure the estate's home is not lost to foreclosure. If you hide your head you could lose hundreds of thousand of dollars in equity. and it works really well! 1. Look at a home and see if there are valuables that are worth selling in the San Mateo home in probate. Many homes are left with enormous amounts of personal property, sometimes with value and sometimes not. For example crappy cars have value, but beautiful over stuffed furniture does not. and fees, and send a check to the heirs. 3. The next step is to separate the recyclable items and find places to recycle. There are people who take metal, The Ecunemical Hunger Project will take clothes, and the City of San Carlos will take to take paint. 4. Next are items that can be donated. Organizations like Goodwill and Saint Vincent De Paul will take some furniture. 5. After everything that can be sold, donated, or recycled is gone then call the haulers. I like Junk King. Since it costs money to haul away trash I only do it after all other ways of disposing of unwanted property have been exhausted. 6. Once the home is free of personal property and debris, the process of making it look as good as possible for sale can begin. representative for the estate of a home in Probate in San Mateo you may feel overwhelmed. But if you use a system (or hire me and let me organize the sale of your San Mateo home in Probate ), it becomes a much less daunting task. What Happens If One Heir Objects to Your Mountain View Probate Sale? The short answer is go to court and let the probate judge decide. If the Personal Representative has full authority under the Independent Administration of Estates Act then he/she has the right to sell the house but needs to go through the Notice of Proposed Action process. What this means is that the Personal Representative has to notify all of the heirs to the probated Mountain View Estate to that he/she has accepted an offer and they get 15 days to object, although sometimes they are given a longer period. If an heir objects to the Mountain View probate sale then everyone goes back to Court for Confirmation. The judge can then make a determination if the sale should go through. The judge may either say the sale is ok or may require an over bid procedure. The bottom line though is that if there are multiple heirs and the proceeds of the sales are to be divided, the sale, like the show must go on. An heir may object to the price or terms, but can not stop the sale. And by certified I don’t mean on Sesame Street. There is nothing worse than getting to the closing of your Mountain View probate sale and finding out, oops you can’t close. Or even worse, you are an out of town Personal Representative on this Silicon Valley Probate Sale and you are told there is a hold up. You need a CERTIFIED COPY OF YOUR LETTERS OF ADMINISTRATION in order to close the sale. Where are they? Did you leave them out the house? Did you leave them with your attorney? Make sure that you have these letters in the certified form in your possession so that you can get them to the title company so that you can close this escrow. There are many things to remember when you have the responsibility of an estate, whether it is a large or small one. There is a lot of paper work. You probably are dealing with mounds of paperwork from your deceased loved one as well as from the court. Just treat the Letters of Administration like gold, since this is what proves you have the right to sell a home that does not belong to you. If you can not find anything else, find these and you can deal with the other papers later. If you have any questions about buying or selling Probate Sales in Santa Clara County or San Mateo County please free to contact me. The market is roaring in Palo Alto and most homes are getting multiple offers. If you are a Personal Representative for a Palo Alto Probate Sale, or a Successor Trustee for a Trust Sale how do you know which is the best offer? How do you choose from the embarrassment of riches, especially if you are not from the area and are not familiar with area? If you follow these steps you should be fine. 1. If you have an all cash offer with no contingencies that is the highest of all offers. Pick that one. 2. If you have an all cash offer for less than a financed offer it may still be the best, but it may not be. 3. If the financed offer has no appraisal contingency and it is higher than the cash offer you can make an argument that that is a better offer because it is higher. If the buyer is pre-approved and the house does not have to appraise for offered price the risk of the transaction falling through because of of the loan not being approved is small. 4. If there are multiple offers with financing contingencies and appraisal contingencies things get a little more complicated. It is very likely that there will be offers that will over what the appraisal will bear. 5. When Number 4 happens I counter offers by asking the agents what will your client do if the home does not appraise for the value you have offered. This is important because if you have a home worth $800,000 and the buyers have offered $850,000 but subject to appraisal, they may have really just offered $800,000 if the home will not appraise higher. So, what I want to know is what is the buyer going to do if the home does not appraise for what was offered. 6. Take the offer that you feel has the best chance of giving the estate the best realistic price based on what the buyer is capable of doing vs what they have offered to do. Even in this crazy Palo Alto seller's market, negotiations still matter, and you will not automatically get what you are offered, so hire someone who knows what he or she is doing and get the interests of the estate protected. Also, if the agent you are interviewing does not know what a Personal Representative or a Successor Trustee is, interview someone else for the job. If you have any questions about selling a home in Trust or Probate in Palo Alto please feel free to contact me. Redwood City Personal Representatives: How Do You Find A Realtor? If you are a Personal Representative for a home in Probate in Redwood City you may be wondering what is the best way to find a realtor to help you sell the estate's home in Redwood City. You probably understand that you have a very large responsibility and making this decision is important. With so many realtors from which to chose, and conflicting information on the internet, it can seem overwhelming. If the realtor has no idea what you are talking about hang up. It is a quick and simple test. If a realtor understand probate, they will know what you are talking about. If they don't understand probate they won't. A Redwood City Probate Sale is not like a traditional sale, a short sale, a foreclosure, etc. It is special and the requirements must be followed or you can find yourself in a lot of trouble. If the realtor you called knows what you are talking about then you can interview, go through a marketing plan, and see if he or she is a good fit for you. Trust me, you will not have too many agents to interview so it should not be a very hard decision. If you have nay questions about selling a home in Probate in San Mateo or Santa Clara County please feel free to contact me. East Palo Alto Probate: Court Confirmation May Not Be Needed: Meaning? When a home is sold through the probate system sometimes court confirmation is required, and sometimes it may not be required. The operative word here is MAY. What this means is that under the Independent Administration of Estates Act, the person in charge of settling the deceased's estate, the Personal Representative, can ask the court if he/she can have the authority to sell a property without court confirmation. Court confirmation happens when an offer is accepted by the Personal Representative and then has to go to the probate court to be approved. At that time there is an overbid process and someone else can come in and offer more money for the house. When a probate listing says court confirmation not required or MAY not be required, what it means is that the Personal Representative was given the authority to sell the home without court confirmation and the overbid process, but it is not a done deal. If one of the heirs has an objection to the price or terms of the sale, he/she can petition the court for an overbid process. This is not common unless the Probate Referee, who is the person who estimated the value of the home, says the home is worth more than the offer for the home. So for example if a home was estimated to be worth $500,000 and the accepted offer was $400,000 and the Personal Representative can not show good reason for the 20% difference, the other heirs may want to go to court and object. So if you are a Personal Representative on an East Palo Alto or other San Mateo County Probate home make sure the agent you chose to sell the home gives you a rock solid market analysis. If the price suggested to list is more than 10% less than the Probate Referee's opinion of value work out the discrepancies ahead of time. It will save countless hours of headaches, and lots of money by not having to go to court. If you have any questions about selling real estate in probate in San Mateo or Santa Clara County please feel free to contact me. I have a new listing coming on the market in East Palo Alto that is being sold through Probate. The seller has passed and the home must be sold to settle the estate. Like many homes in probate, this East Palo Alto Probate is filled with personal belongings that need to be disposed. The owners are at a loss, so they hired me, because I specialize in dealing with selling San Mateo County homes in probate and can help them deal with the mounds of personal property. The Personal Representative of the estate is one of the sons of the deceased. In addition to the home being filled there were also two automobiles, and 2 large mobile bar-b-ques that his father used for his catering business. The first thing I did was call an auction house DGW who sent someone to look at the home and contents to see if any of the contents were saleable. The Personal Representative had already given the court an estimate of the value of the personal property and his attorney said it was ok to go ahead and sell anything of value so that the money could be distributed amongst the heirs when the estate is settled. The rep from DGW said there was some value in the estate and suggested we call the office to set an appointment for pick up. This auction house will pick up the items they think they can sell and take them to auction. We had the pickers come to the house and remove those items which they thought they could sell. It was only a small portion of what there actually is. They said furniture, especially upholstered furniture has no market and they only took the cars, the stetson hats, some tools, sewing machines, and some very nice boots. When they left the house was still packed. Well, the next step is the other son is inviting the family to come and take what they want. This is ok, because they can prove the remaining items have no monetary value. they could not do it before the appraiser from DGW came and said everything left is not saleable. I will go there after the family has taken what they want and access the situation. This East Palo Alto Probate is to be continued. If your are the Executor or Personal Representative for a home in Trust or Probate you may be faced with a home to sell that can be anywhere from in need of a little TLC all the way to being totally gross. So the question is what can you do to not overly expose the estate to liablilty while still doing what you can to maximize the price you can get for the home. 1. Get the smell out. Painting, ripping out old carpet, and removing old furniture and window coverings is usually enough. Professionally clean the house. 2. Stage the home with clean and modern furniture and accessories. 3. Spruce up the landscaping, water the lawn, and add some flowers. 4. Replace old light fixtures and hardware. Notice I do not say repair anything. If there is a major health or safety issue speak with your estate attorney about how repairs may effect the liability of the estate. If the estate does not have the money to do any of these things find a realtor who can help you find contractors who will agree to be paid at closing. Or call me. I provide many of these services, including free staging in my commission. If you have any questions about buying or selling a home in trust or probate anywhere in San Mateo or Santa Clara Counties, please feel free to contact me. 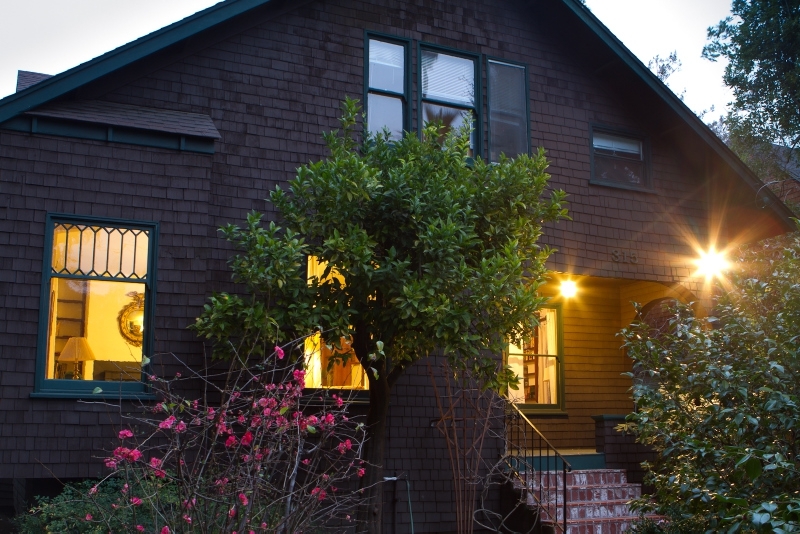 When is a Palo Alto Home Sold Through the Probate Court? This is the most basic question there is on probates, but I keep getting the question so I guess is needs to be answered. The answer is : When the home has not been placed in a trust by the owner. It is that simple. It is not a question of is there a will or no will, it has nothing to do with the value of the estate, and it has nothing to do with whether the heirs are on good terms or can not agree on anything. If a person, or people own a home, have a trust, and put their home in that trust, then when they die, the home is inherited by whom ever they have designated as their successive trustees. If those same people do not set up a living trust then whether they have a will or not, the estate needs to go through probate court in order to be sold or distributed to the heir or heirs. If you have any questions about trust or probate sales in Santa Clara or San Mateo Counties please feel free to contact me. In a San Mateo County Probate Sale What is a Personal Representative? There is often confusion about who does what in a probate sale so today I am going to write about the Personal Representative. When a person dies they either leave a will (or a trust) which names an executor for their estate, or die without a will (or a trust) and therefore no executor. If there is no trust then the estate must be probated. The probate court determines who will be the personal representative for the estate. The duties of the personal representative are very similar to an executor, but ultimately everything they do has to be approved by the probate court. If an executor has been named in a will then that person can petition to be the personal representative, but the court has to approve. Once appointed the personal representative can ask for full authority to sell any real property but that is not always granted depending on the circumstances. If the personal representative gets full authority to sell the house then they can accept an offer just like an executor would in a trust sale. It does not have to go to court for confirmation and overbids, but the distribution of the funds is overseen by the court. If you have any questions about trust or probate sales in San Mateo or Santa Clara County please feel free to contact me. Menlo Park Short Sale in Probate, Should I Bother? The question of whether to short sell a home in probate used to be rare, but now unfortunately it is not. There are estates where the owner dies, owes more than the house is worth, and a decision needs to be made by the Personal Representative (executor) as to what to do. My opinion, try it. If it is in the best interest of the bank/investor to short sell rather than foreclose they will do it. If it is not, they won't and will take it to foreclosure. So who benefits if the home is sold as a short sale? Well the realtor for sure. The commission is paid by the bank. However, if the attorney's fees are put on the HUD1 statement (the statement saying who is paying for what and who is receiving what money) the bank may pay them. Also, the payment to the personal representative can go on the HUD1. This would make it worthwhile for the Personal Representative to try and do the short sale. This can be very handy if the representative is a Bank or Professional Fiduciary. The heirs do not get anything out of a short sale so it does not matter to them if the property is foreclosed or sold short, but it does matter to the neighborhood. A vacant foreclosed home brings the other homes around it down, while a short sale is cared for by the realtor and even if vacant is not abandoned. 2. Disclosures are limited. You will not be given a transfer disclosure statement, a seller’s supplemental disclosure, an earthquake hazard report, or a signed Natural Hazard Disclosure. You will be given the report, but the successor trustee does not have to sign it. 3. The water heater needs to be strapped but there is no smoke detector requirement for a trust house. 4. If the Personal Representative has information about the house they have to give it to you, but they may not know much. For example, if the Personal Representative is a child of the owner and was involved in repairs on the house they will need to disclose that. 5. All heirs to the estate are given a Notice of Proposed Action to sell the home. If this is not done until after an offer is accepted by the successor trustee then they have 45 days to return the notice or any objections, so escrow can not close before then. 6. If the offer needs court confirmation then things can get tricky. After an offer is accepted the court sets a confirmation date and a minimum over bid amount. On that day another potential buyer can purchase the house if they offer the amount of the overbid or higher and the first buyer does not want to offer more. At that point the subsequent buyer can not have any contingencies and must accept the house the way it is. Do Atherton Trust Sales Always Require a 45 Day Close for Notice of Proposed Action? The answer is, ask your lawyer? When a home is being sold through a trust, the heirs of the estate need to be informed. If there are any objections they need a chance to express their concerns. It does not mean that the home can not be sold, just that whatever the objection is needs to be dealt with, sometimes through court action. There heirs can agree to to forgo the 45 day waiting period for the Notice of proposed action by singing off before the home is sold. So, if you are selling a home in trust be sure and ask your lawyer if the waiting period can be waived before the sale of the house so that the escrow can close in less time. You don't want to sign an offer with a 30 day close and find out there needs to be a 45 day waiting period. Why Use a Trust Department To Be the Executor of Your Estate? Deaths in families are always hard. They can bring out both the best and worst in a family. There is often a combination of sorrow and a bubbling to the surface of many past, and normal family rivalries and childhood issues. Every estate must have an executor and this executor can be anyone the owner of the estate appoints if the estate has been put in trust. If there is no trust but there is a will and the will names an executor that person must be affirmed by the probate court. If there is no will the probate court will asign a personal representative. 1. Everything is done in a fair and impartial manner. No one gets to help themself to some personal and sometimes valuable effects that were not specifically left to them. Everything is divided according to the terms of the trust or will. 2. No one is left to do the many many hours of tedious work needed to dispose of the estate leaving them resentful and/or exhuasted. A professional does that. 3. There are laws which govern how an estate is settled. They must be followed or there can be financial consequences. Trust departments are experienced in following these laws and doing things properly. 4. Sometimes estates are to be distributed over time instead of in a lump sum. When this happens trust departments are in a good position to hold the money and distribute it in accordance with the terms of the trust or will. 5. Trust departments charge money. It will cost your heirs money to have a bank settle an estate, but it may be worth it to have things done properly and keep peace in the family. Home prices in Palo Alto have skyrocketed over the last 30-40 years. There are many homeowners who bought in Palo Alto in the 50's and 60's for $15,000-$35,000, paid off their mortgages, and stay in their homes until they die. In the 50's and 60's if you worked for the city you were required to live here, and many teachers, police officers, firefighters, and other city employees bought modest homes, often in south Palo Alto. Sometimes these homeowners have very little to leave their heirs other than a home worth a million dollars or more. If you inherit one of these homes you may be faced with the prospect of inheriting a large sum of money, but do not have the ready cash on hand to pay for the expenses needed to settle the estate. There may be bills to pay for utilities, lawyers, gardeners, haulers, appraisers, and fix up costs. There may even be a mortgage that is needed to be paid. If this happens you may be able to borrow money from a local bank until the estate is settled. You may have to have a listing agreement in place before you can get the loan but this can vary with the bank in question. Fortunately, the market in Palo Alto and surrounding areas is very strong, so a home that is properly priced and marketed in the Silicon Valley and Peninsula should sell quickly and not use up a lot of interest that would otherwise go to the heirs. If you have any questions about selling a home in Probate or Trust please feel free to contact me. If I can not answer your question I will find the appropriate professional who can. California has a lot of disclosure laws for the protection of all parties in a real estate transaction, particularly buyers. There are buyers who do not want to buy a home where there has been a death on the property, and there is a disclosure obligation to disclose if there has been a death in recent years. This works very well if the seller has to fill out the Seller's Supplemental Disclosure or The Seller's Property Questionnaire and Supplemental and Contractual Disclosure forms. But many trust properties are exempt from those disclosures, and many of those properties would be more likely to have had a recent death. So what do you do if you want to know if there has been a death on a Mountain View home that is exempt from seller's disclosures? The answer is really simple, ASK THE SELLER. What you have to do is for you or your agent to ask the seller's agent to ask the seller directly if the owner died in the house. While the trustee or executor does not have to fill out the written disclosure asking about a death, they do have to answer honestly. Trust me, the person selling the house will know. The trust advisory that the buyer is supposed to sign when they make an offer tells you to do that. It says "If the Property is being sold because of the death of an occupant of the Property, and if Buyer has concerns about the manner, location, or details of the death, then Buyer should direct any specific questions to the seller." So if you are concerned, ask. Memories can be housed in stuff, especially as people gets older and they find that objects are needed to jog their memory. The problem is that very often when it is time to leave the place that has been home for 30, 40, or 50 years, there is wall to wall stuff. The plate on the wall that was handed down by great grandmother is probably not going to be wanted by great grandchild number 1. However, with the normal tensions that arise in settling an estate, and the enormous popularity of shows like Pawn Stars and Antique Road Show, many heirs believe that the house full of stuff they have inherited may be worth something. Also, if you need to sell a probate or trust home in order to settle an estate this stuff needs to be cleared out. In order to keep the peace in the family and to make sure that nothing is overlooked the most logical thing to do is get the personal contents appraised. If the sale is a probate sale, this is already written into code. A probate referee will be in charge of making sure all of the personal effects are inventoried and appraised. If the property is in a trust, the personal effects are the responsibility of the trustee of the estate. If you are the trustee, get everything appraised and sold by a professional estate seller. You can get a company like DGW to come in and take everything to their warehouse to be sold at multiple auctions. Or you can have an estate sale at the house and then get rid of anything that does not sell. The point is, get a professional who is trustworthy to sell things for the most that they can sell for. If there is something valuable these people will know and it will keep the peace in the family. My only other advice would be go through all the papers, envelopes, and furniture yourself. You never know where mom may have stashed cash for an emergency. You are more likely to find money that way, than in the antique piano that no one wants. As per the Trust Advisory or Propbate Advisory that needs to be signed in each of these transaction the Trustee in the case of a Trust, or the Personal Representative in the case of a Probate, is required to provide a Natural Hazard Disclosure report, but is not to sign the report. The most common request I have with these sales is for the Trustee's signature on the Natural Hazard Report. It is not an oversight that it was not signed, it was on purpose. If you have any questions about trust or propabate sales in Santa Clara or San Mateo Counties, please feel free to ask me. Why Is A Palo Alto Escrow Like a Teen Romance? The beginning of a Palo Alto escrow is like the beginning of a teenage romance, everything is perfect. You have found your soul mate and all promises are meant to be kept. You never dream that your heart will ever be broken. It doesn't matter that one party is a jock and the other an intellectual, one is a Democrat and one a Republican, or one likes to party and the other is a vegan. And then reality sets in. I don't think I have to go into gory detail. Well, sometimes an escrow is like that but hopefully your escrow will have a better track record than a teenage romance. One way to help things along is to not set yourself up for failure. If you are a buyer or buyer's agent do not expect to get a loan approval in 15 days if you do not have every document into the lender a head of time. If you are a seller or seller's agent and accepted an FHA loan do not try to make the buyer get approval in 15 days. If the seller does not get inspections a head of time do not tell the buyer they have 7 days for property contingencies and then start yelling because the property inspector says there is something wrong with the foundation and they need more time for an engineer to look at it. Bottom line, do not set yourself up for failure by blowing a gasket over unrealistic time frames. Try to make them realistic to begin with so that the parties can succeed rather than fail. Do You Care About Your Children? I am not a lawyer or an accountant so please do not construe this as legal or tax advice. However, friends do not let friends leave their estates to probates, so let’s just say I am your friend. As a realtor who specializes in Probate and Trust sales, it does not matter to me whether the estate is being probated, or passed down through a trust. But it does matter to the heirs, especially now that the estate tax will kick in after a million dollars starting in January, unless Congress and the administration change it. How likely is that? They can not even agree to have dinner together so changing the estate tax exemption any time soon is unlikely. So as of Jan. 1, 2011 when you die your heirs can get the first one million dollars of your estate tax free, but anything above that will be taxed at 55%. So let’s say you have a home that is worth 1.2 million and a mortgage of $700,000. The estate will be valued at 1.2 million not $500,000 which is the equity. If you have your estate in trust you can set things up to help reduce the taxes owed. Even if you do not have a mortgage on your home, if you have a home in Palo Alto you are very likely to have an estate worth over a million dollars because of the value of your home. You will probably benefit by talking to an estate lawyer to help structure things to get the most tax free money for your heirs. I can give you names of some excellent estate attorneys if you need a referral. When you sell or purcahse a trust or probate sale, the disclosures are not the same as in a standard equity sale. The basic premise is that while the trustee or personal representative in the case of a probate does not fill out a Transfer Disclosure Statement or Seller's questionnaire, if that person knows anything about the house it needs to be disclosed. It can go on a separate addendum but can not be hidden. This is especially true if that person lived in the home with the person who has died, like a child, or other relative. There are CAR forms which should be used, The Probate Advisory or the Trust Advisory, that spell out which disclosures are exempt, and which are not. The trustee or personal representative are exempt from filling out the TDS, Seller's supplemental or questionnaire, They do not have to sign a Natural Hazard Report or provide a Mello Roos Report. They do not need to provide smoke detectors. they do not need to provide the Hazard Booklet. They do need to provide a Natural Hazard Report, strap the water heater, provide a lead based paint disclosure, Data Base Disclosure, and FIRPTA. I hope this clears it up and that you do not find anything terrible lurking behind the curtain. Please feel free to contact me if you have any questions. Why Should You Stage Your Palo Alto Trust or Probate Sale? Have you noticed that there is an increase in the number of trust and sometimes probate sales in Palo Alto and the surrounding areas? Here is a logical explanation for this. The World War 2 generation is unfortunately dying off. Many people in this generation lived in their homes for many years, and did not keep up with the latest interior design styles even if they were good at maintaining their homes. Some people spent too long living without help the homes may have smells, stains, or deferred maintenance. If you are an executor or personal representative for one of these homes it may be your responsibility to sell a home and you are faced with some big decisions. Most estate attorneys will tell you need to sell the home "As-Is" and not to do any structural repairs. But what about cosmetics? These homes are often cosmetically challenged and could use a little lipstick. If you speak with a realtor you may be advised to clean up and stage the home. Listen to that advice. A home that is clean, painted, staged, and de-odorized will sell much faster than a home left in a sad looking state. If there was a death on the property there is an even bigger challenge in selling the home, so you will want to make the house look better and be priced aggressively to overcome the negative of the death on the property. A few thousand dollars can go a long way in getting a home from last century looking like it is ready for living in this century. I provide free staging and co-ordinate some cosmetic upgrades for my probate and trust sales in Santa Clara and San Mateo Counties and those homes generally sell quickly and for good prices. If you have any questions or need any help selling your home please feel free to contact me. Probate Referees: Why Are They Used? At the beginning of probate when there is a petition to administer the estate the court will appoint someone to be the personal representative of the estate. This is often the person that was named as the executor in the will, unless that person is unavailable, unwilling, or there is a challenge from someone else. Once the personal representative is appointed, the court will also appoint a probate referee. This person is charged with valuing the estate including the personal property and real property. There is a form that the personal representative is supposed to fill out within 60 days which gives the value of the estate for both tax purposes, and in order to settle the estate. The referee will determine the fair market value for the estate and in the case of a probate sale that needs court confirmation the general rule is that the offers should be within 10% of this value. It is possible to sell the home for less, but a little trickier and often involves re-doing the appraisal. The sales that require court confirmation can not be confirmed until the referee has valued the estate. If the personal representative has full authority to sell the real property without court confirmation then the sale can go through, but the probate can not be completed and the monies distributed until the referee has done his or her job. If you have any questions about buying or selling a home in probate in San Mateo County or Santa Clara County, please feel free to contact me. I am an experienced probate realtor. Have you ever noticed that homes where there has been a death on the property sell for less than a comparable home where there has not been a death ? In California it is mandated that if there has been a death on the property it must be disclosed. There are many people who do not want to buy a home if there has been a death because either they think it is bad luck, or they feel that other people will think it is bad luck, and therefore have bad resale value. Problem: with the incredible growth of home hospice, as well as an aging population, a lot more people are dying at home. Most relatives do not tell their family members to go die somewhere else so the house is worth more. No, they provide loving hospice care so that people can die in peace in familiar surroundings. Solution on the horizon. More and more buyers are saying that they do not care if someone has died, but they are worried that a future buyer will care or their parents will say it is a bad investment. If you understand the premise that real estate is long term investment and not a short term road to riches for most people, then you can see that the younger generation of buyers are not nearly as worried about ghosts as their parents. Over time, the parents will be gone, and this generation will probably have very few people who are concerned about a death on the property. The point of this: If you buy a Silicon Valley probate or trust sale and there was a death on the property you will probably get a great discount. The homes I list where there has been a death are selling about 10% less than homes where there has not been a death. If you sell again in 10-15 years there will probably be many fewer buyers who care and you may make 4-7% just on the death in house issue plus any appreciation earned over time and for modernizing a home. On a $600,000 that is $24,000 to $42,000 just for buying a Silicon Valley probate or trust sale where there has been a death. For a million dollar property that is $40,000 to $70,000. So, maybe it is time to re-adjust your thinking about what was once considered a major flaw in a property. I See Dead People or Why Is A Probate or Trust Sale Like An REO? My sister in law as executor of the estate just sold my mother and father in law’s house. She chose a realtor who lived in the neighborhood who also was an reo realtor without a lot of reo inventory right now. (Not an unusual situation) She turned out to be the perfect agent for the job because of her REO background. She took a home that was filled to the brim with things that no one in the family wanted, had it cleaned out, trashed out, secured, on the market at an aggressive price, and sold in 2 weeks. I couldn’t have done better myself, except I would have staged it, but that is a separate story. Getting a probate or trust sale ready for market is very similar to an REO. When a homeowner dies his or her personal property must be disposed. Things of value need to be appraised for tax purposes and are distributed accorded to the terms of the will, or in the case of no will sold and the money distributed according to state law. There is often much left over that is not of value and someone needs to trash the home out, much the same way as an REO home is trashed out. This job is often left to the realtor. The home will almost always be vacant, and again the realtor will need to make sure it is secure. While probates and trusts do have some differences in the technicalities of sale from an REO, many of the disclosure exemptions are the same. The executor is exempt from the transfer disclosure, the seller’s questionnaire, the smoke detector requirement, and signature on the natural hazard report, but not exempt from providing the report. If the realtor knows anything about the property he or she does have a duty to disclose anything that is material. The other big similarity is that both REO homes and trust or probate homes have to be sold. They are not owned by people who have the luxury to test the market and sell if they get the price they want. They need to be sold, either to settle an estate or in the case of an REO to mitigate a loss. As a result they are a wonderful opportunity for a buyer to get a home at a great price or a realtor to get an assured sale. Both sides win in these types of sales. So why the comparison? If you are an REO realtor and add probates and trusts to your repertoire then many of the skills you have learned are very useful. If you are an investor it is a good place to look when REO inventory is not getting you everything you want. If you are an end user buyer these homes are worth exploring because of the motivation of most of the sellers. California has very extensive disclosure requirements for residential sales which are of great benefit to the buyer. They are a very good blue print for what kinds of issues need to be disclosed, which is of great benefit for the seller. However, when you’re in charge of selling a home that’s in probate the personal representative for the estate is not required to give some of the California mandated disclosures to the buyer. The disclosures that are not provided by the personal representative include: The Transfer Disclosure Statement, The Seller’s Questionnaire, Earthquake Hazard Booklet, Earthquake Hazard Questionnaire, the signature on the Natural Hazard Disclosure but the report needs to be provided, and Smoke Detector Compliance. The personal representative of the estate is not exempt from Lead Based Disclosure, Data Base Disclosure (Megan’s Law), Water Heater Disclosure and strapping, and disclosing anything that is personally known by the representative. The anything that is known is the big one. It is probably better to do this on a separate addendum rather than just answer a few of the questions on the seller’s disclosure forms. So if you ever lived in the house or spent time there and know something, disclose it. It is so much easier to disclose before the sale, than after in front of anarbitrator or judge. The estate will thank you! What is a Probate Sale? 1. Probate courts have various responsibilities, but in regards to real estate probate is the process of distributing the estate of a deceased person, called the decedent. The estate is any property or cash that has not been distributed into a trust. 3. If there is a will, a Testate Estate, the person named in the will as the executor can petition the court to be appointed the personal representative of the decedent and be responsible for disposing of the assets. If that person does not want to serve as the personal representative, or if there is an objection from the heirs, or if that person is not eligible then another person or sometimes a trust department at a bank, can be nominated to serve as the representative. 4. If there is no will, an Intestate Estate, the court will appoint a personal representative, or the heirs can nominate someone for the court to approve. Again, sometimes this is a trust department in a bank. 5. Once a personal representative is appointed that person or trust department is responsible for distributing the assets of the estate to the heir or heirs. If this includes property a realtor will be chosen to help sell the home. 6. If the personal representative asks the court for full authority to sell under the Administration of Estates Act (AEIA)then the representative has the right to sell the real estate without court confirmation. 7. If the representative does not request full authority to sell, or the court does not approve an AEIA, then the sale takes place but needs court confirmation. 8. If court confirmation is needed an offer is accepted by the representative and then a court date is set. At that court date another buyer can come in and offer at least a specified amount over the accepted offer. There can be no contingencies and the first buyer has the opportunity to beat newer offers. This process is rarely done anymore. These are just the basics and I'll put another post up later with more details. But the important question is why should you care? Well, there is a great reason to care if you are a buyer or a seller. If you are the executer, or personal representative you can see that this is a complicated subject and you should find a realtor who knows what he or she is doing. If you are a buyer these sales can be a great investment for you. In general, if a home is being sold as a probate sale it means the estate HAS to sell. It is much better to buy from a seller who has to sell than a seller who wants to sell if they get the right price. You get similar advantages to buying an REO or Short Sale, but a lot fewer hassles.